In which we enter a murky wacky world of mumbo-jumbo, clarity, and soot. 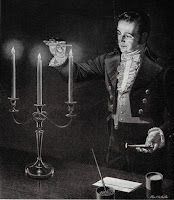 My lifelong experience with paraffin had been so innocuous and what I was reading about it in “The Chemistry and Technology of Waxes” seemed so benign, yet interesting, that I decided it was time to delve into some candle emission studies to try to uncover why there was all this online hullabaloo (among some) about paraffin being poisonous. I searched out and read several studies, but only those that I could find online, for free, and when it seemed to reach the point of enough said, I stopped. So I am sure I did not cover the whole gamut of what is out there. But, that said, if online claims that paraffin candles are toxic are linking to any research, they are not linking to any research I have not read. That said, please recall I am not a chemist and understanding some of the terminology and numbers and particulars in these studies is beyond me. But, that said, some parts of these studies are written in plain—or nearly plain—English. Those are the caveats. Here we go. The report introduces us to soot. The Schwind and Hosseinpour study mentioned in the EPA report comes from Germany. 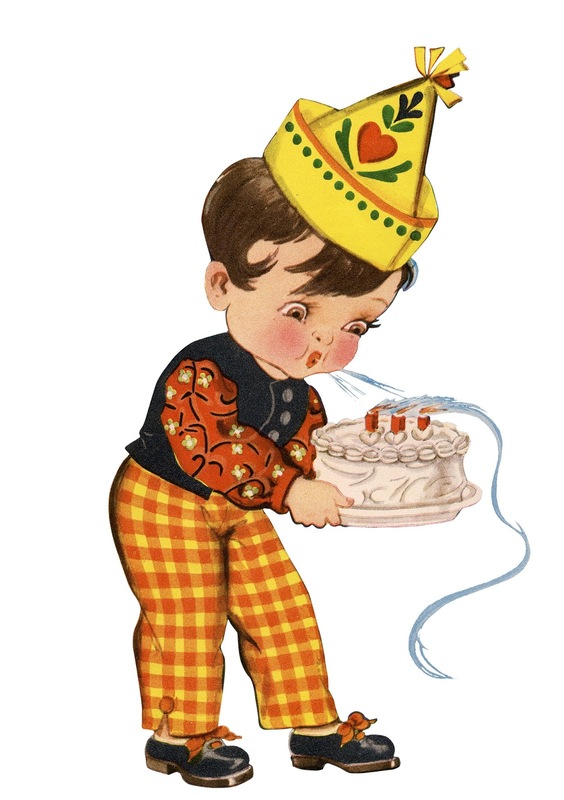 It has the unwieldy title “Determining and Evaluating the Emissions of PCDD/PCDF, PAH and Short-Chain Aldehydes in Combustion Gases of Candles.” For what it’s worth, PAH is “polycyclic aromatic hydrocarbons” and PCDD/PCDF is “polychlorinated dibenzo para dioxins/polychlorinated dibenzofurans.” But please don’t quote me on that. The study looked at waxes, wicks, emissions, and toxicity. And here is Table 5, a beautiful mass of indecipherability, which is sometimes the best way to see—and leave—things. 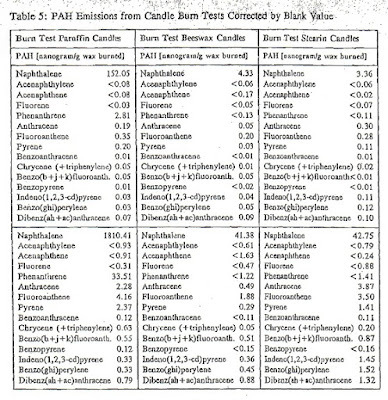 So in 1994 a candle emissions study cited by an EPA report in 2001 finds that “Candles made from paraffin are toxicologically just as innocuous as beeswax or stearin candles.” I emphasize this finding because the next study ignores it. Several studies of candles indicated that paraffin wax candle burning could cause serve health problems from the harmful burning emissions. The “several studies” are not named and I could not find them. Sponsored by the National Institute of Food and Agriculture (part of the USDA) and directed by Ruhullah Massoudi, a chemistry professor at South Carolina State University, this study, or, should I say, the document I found related to the study, is basically a series of progress reports spanning 2006 to 2010. Within it I never found a citation or evidence for the project’s contradictory premise that there are “health problems associated with the use of petroleum based candles.” I did find a lot of funny stuff. I am so curious: Who burns candles in cars? Indeed, this soy candle project garnered “enormous publicity.” Any article about how your romantic paraffin-candlelit dinner is toxic stemmed from this study and the number of times I have seen sentences or parts of sentences taken from this study and plopped into “wellness” blogs and in the promotional material of beeswax and soy candlemakers, without citation or clarification, is legion and mind-boggling. It seems from this one haphazard project everyone swallowed whole a notion that paraffin is toxic. The National Candle Association (NCA) is calling upon the leadership of South Carolina State University to remove information from its website about research that the trade association says is erroneous, unsubstantiated and misleading. In letter to South Carolina State University president James E. Clark, Dr. John Heinze, science consultant to NCA, explained that the research, conducted by university faculty member Dr. Ruhullah Massoudi and an undergraduate student, was flawed from the start and that statements about the study included in a university press release are without merit. The press release remains on the SCSU website despite the fact that the study has not been published, or subject to scientific peer review in the years since a summary of the study was presented at a scientific conference (August 2009). Further research on this topic has not been reported by the authors, nor has Professor Massoudi responded to a previous NCA letter in 2015 pointing out the scientific errors in the study. Industry is not without its drama. So it begins to look as if the whole “paraffin is toxic” thing was just something cooked up by a few soybean hopefuls looking to expand their market by dissing, dousing, and slandering the competition. They used a scare tactic, and that such an unfounded claim could spread like a fueled flame should, I suppose, come as no surprise. After all, the idea plays extremely well; it’s almost too easy. Imagine: In your home you are burning a product related to gasoline and kerosene and crude oil and diesel fuel. Now imagine: In your home you are burning a product related to a leafy green plant, or, better yet (if you are not a vegan), a product of the honeybee—a creature we must save—a creature who sipped nectar from a flower and aren’t both our honeybees and soybean plants bumbling about in a delightful breeze on a lazy, sun-drenched, summer’s day? Which picture spells dirt and doom? Which picture plays clean and light? Most of the risk, he says, comes from the soot that scented candles emit to a much higher degree than non-scented candles. He draws a similarity between diesel soot and candle soot as they “share the same physical and many of the same chemical properties which are believed to contribute to both toxicity and carcinogenicity.” There are existing reference points for diesel soot; there are no such reference points for candle soot. So Krause draws a similarity between the two in order to apply one’s reference points to the other. If you can tell me what those numbers mean, well, give it a try. Krause’s “Black Soot Deposition: How It Impacts IAQ” (Indoor Air Quality) was published in 2001 by The Refrigeration Service Engineers Society Journal. It is readable and clear, addressing an increase in the number of complaints about soot build-up in homes received by the Florida Department of Health in the 1990s. Krause explains what soot is (“a product of incomplete combustion of carbon-containing fuels”) and explains that a blue flame indicates complete combustion, a yellow flame incomplete combustion. 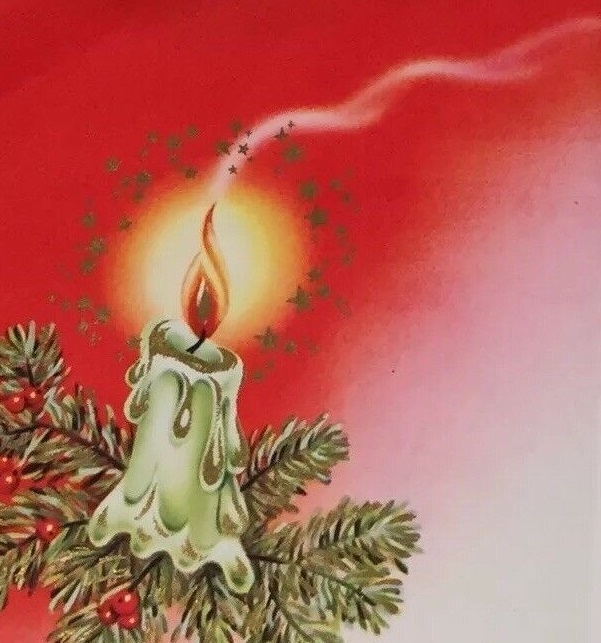 As it turned out, the soot that people were complaining about could be traced back to candle usage, and, in particular, the use of certain types of candles and, as well, the manner in which the candles were burned. How airborne candle soot circulates captured my imagination. Initially particles float around on air currents, potentially inhaled, but eventually soot particles succumb to gravity and attraction, landing here and there in the home. Soot build-up is described as black streaks on walls, curtains, blinds, and carpets. Krause explains that soot is attracted to cooler surfaces due to thermophoresis, and that soot is also “attracted to electrically charged surfaces … ” And I ask you, how could this not bring to mind negative ions being attracted to positive ions? Have you not heard the story about beeswax candles emitting negative ions that clean the air by latching on to positive ions free-floating in your home’s air and how these positive and negative ions conjoined then drop out of the air, thus cleansing the air, and … go where? Could this explanation of what soot does—attaching itself to electrically charged surfaces—be at all related to this malarkey I’ve heard about beeswax, negative ions, and clean air? In conclusion, I did not find any evidence that an unscented, well-made, high quality paraffin candle burned responsibly should for any reason detract from your romantic candlelit dinner nor potentially kill off your lover nor dirty your tablecloth with sooty black streaks unless, of course, someone at this romantic candlelit dinner gets too excited, knocks over the candle, sets the tablecloth aflame, and, blooey, that’s it. I do think there is enough evidence to be suspicious of candles that are not well-made, that are made of low-quality wax, that are wrapped up in jars, that are scented. But, if whatever is spewing from any particular candle you are burning isn’t bothering you, why worry? And if it is bothering you, stop burning it. Try an unscented candle, try something not in a jar, or try beeswax. It comes by its scent naturally—no added oil—and it stands on its own—no walls necessary. But of course, I am no a chemist. “Emission of air pollutants from burning candles with different composition in indoor environments” Derudi, M., Gelosa, S., Sliepcevich, A. et al. Environ Sci Pollut Res (2014) 21: 4320. “Emissions of air pollutants from scented candles burning in a test chamber” Science Direct, 2012. “Determining and Evaluating the Emissions of PCDD/PCDF, PAH and Short-Chain Aldehydes in Combustion Gases of Candles” Schwind, K., Hosseinpour, J., Fiedler, H., Lau, C., Hutzinger, O., 1994. “Soybean Candles for Healthy Life and Well Being” USDA, 2006-2010. Candlelight: A Dash Of Toxin With Your Romance? Hensley, S. National Public Radio, August 20, 2009. 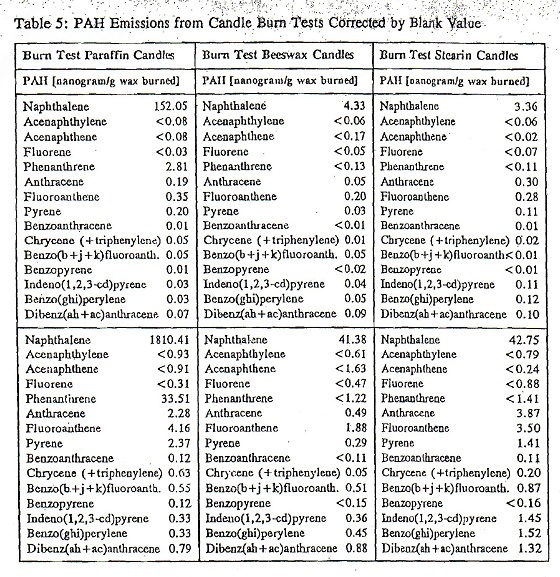 “Characterization of Scented Candle Emissions and Associated Public Health Risks” Krause, D. 1999. “Black Soot Deposition: How It Impacts IAQ” Krause, D., The Refrigeration Service Engineers Society Journal, 2001.